Hello ... Hello ... my old friends ... It's great to see you once again! 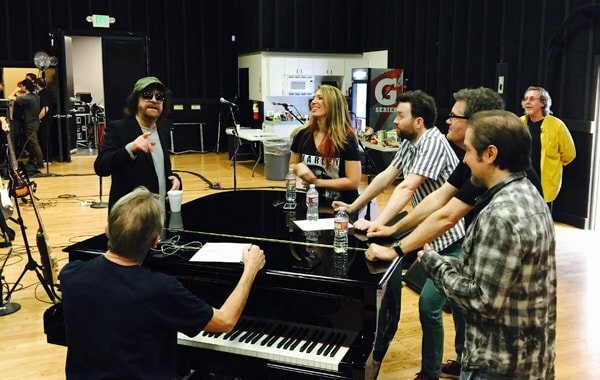 A nice photograph has been published in the last few hours via the Jeff Lynne Official Facebook page depicting a relaxed atmosphere as preparations for the 57th Grammy Awards ceremony at The Staples Center in Los Angeles later today [Sunday 8th February]. The photo shows the ELO co-founding maestro conducting Jeff Lynne's ELO who will be Richard Tandy [naturally! ], newcomer Tyra Juliette, Iain Hornal, Mike Stevens and Lee Pomeroy with Phil Hatton looking on. Drummer Donavan Hepburn is out of shot.